Today is a HOT day. Well, at least for Colorado, it is. Thanks to my air conditioner and iced coffee, I am a comfortable, happy girl. In regards to food, I do not prefer extreme levels of spicyness, but I do like a hint of it. 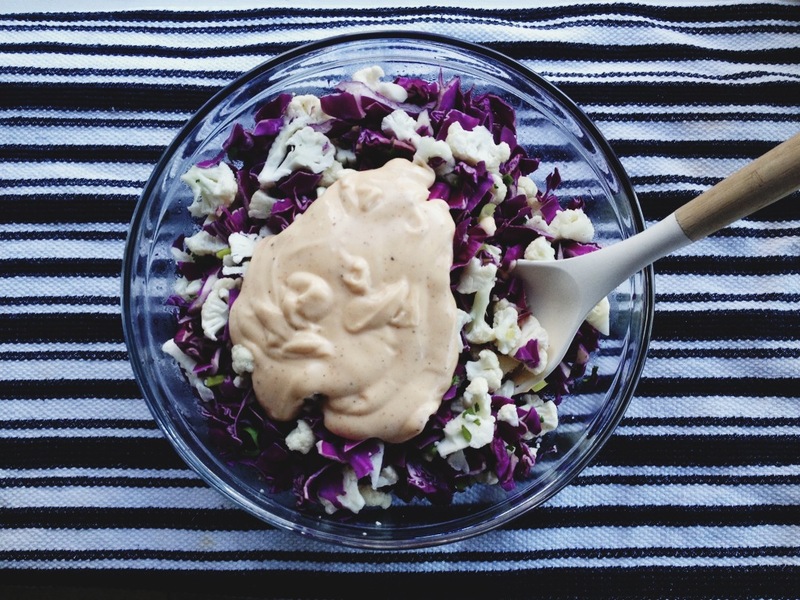 So if you can handle a little spice in your life, here is a coleslaw for you! ….add any vegetable of choice! Mix spoonfuls of the dressing to your salad, until you get a desired level of moisture.. you may not need to use all of it. I liked this level of heat, but if it’s not enough, you can always add more hot sauce! This goes great with bbq grilled chicken, fish tacos, or hamburgers on the grill!